A pair of 19th Century weavers’ scissors from the Sma’ Shot Museum were used on Thursday to cut a giant shop label and mark the official opening of the new InCube Shop. The mix of old and new emphasised the link between Paisley’s traditional crafts and InCube’s contemporary design. The shop, at 9b Gilmour Street, sells fashions and textiles from: Amy McGregor, Vonnie Designs, children’s clothes by Treetops Boutique, bridal accessories by Bella Brill, Art by DOM Art, Houlahan guitar accessories and hats from Pea Cooper. 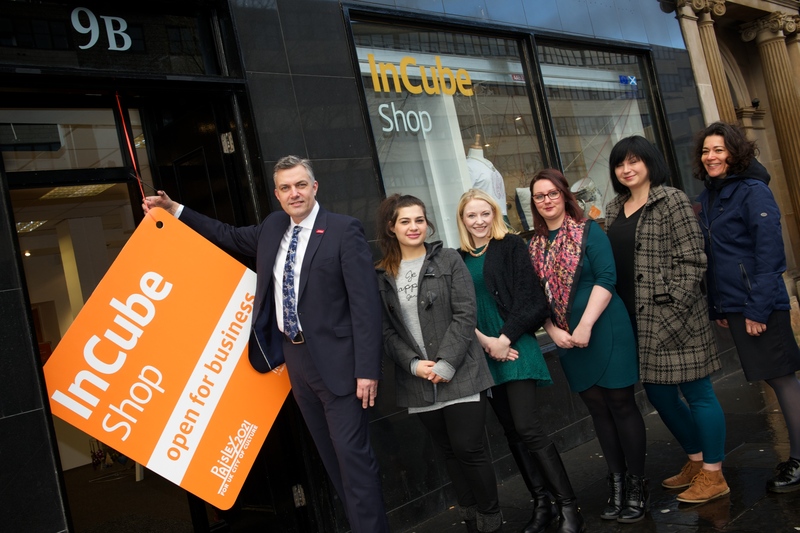 All businesses are part of Invest in Renfrewshire’s business incubator, InCube, where they are receiving a year’s support to kick start their enterprises. The InCube shop’s window has been dressed to support Paisley’s bid for UK City of Culture 2021 with brilliantly coloured threads linking the modern products with a vintage sewing machine. Councillor Macmillan continued: “Entrepreneurs are vital to Renfrewshire’s economic growth. This is Global Entrepreneurship Week and I’d like to encourage any residents who are thinking about starting their own business to contact Invest in Renfrewshire and tap into the support we can offer. In the meantime, I congratulate all the InCube creative enterprises and wish them every success as part of Paisley Town Centre.